John A. Detre, M.D. is Professor of Neurology and Radiology at the Perelman School of Medicine where he is founding Director of the Center for Functional Neuroimaging in the Department of Radiology and serves as Vice Chair for Research in Neurology. He received his bachelors and medical degrees from Yale, completed fellowships in biophysics at both Carnegie Mellon University and the University of Pennsylvania, and completed neurology residency at Penn, where he has been on the faculty since 1993. Dr. Detre is also among the core faculty of the Center for Cognitive Neuroscience, currently serving as interim co-director of this Center. Dr. Detre has been continuously funded by NIH since 1993 and is the author of over 250 original manuscripts. Drawing upon his interdisciplinary training, collaborations, and leadership skills, Dr. Detre has provided core support for neuroimaging research on the Penn Campus through an NIH funded P30 Center Core in Neuroscience Neuroimaging that is now in its eleventh year and through the Center for Magnetic Resonance and Optical Imaging, where he leads a core on imaging brain structure and function. Dr. Detre has also been extremely active in mentoring of trainees from both biophysical and biomedical backgrounds. He has been the recipient of a Mid-career Award in Patient Oriented Research and Mentoring and an NIH training grant in neuroscience neuroimaging. 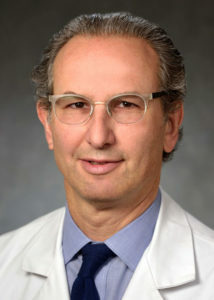 He currently serves as Principal Investigator of an NIH training grant targeting the career development of academically oriented neurology residents and fellows, and he serves as a mentor for several trainees and junior faculty at Penn and neighboring institutions pursuing careers in biomedical neuroimaging.